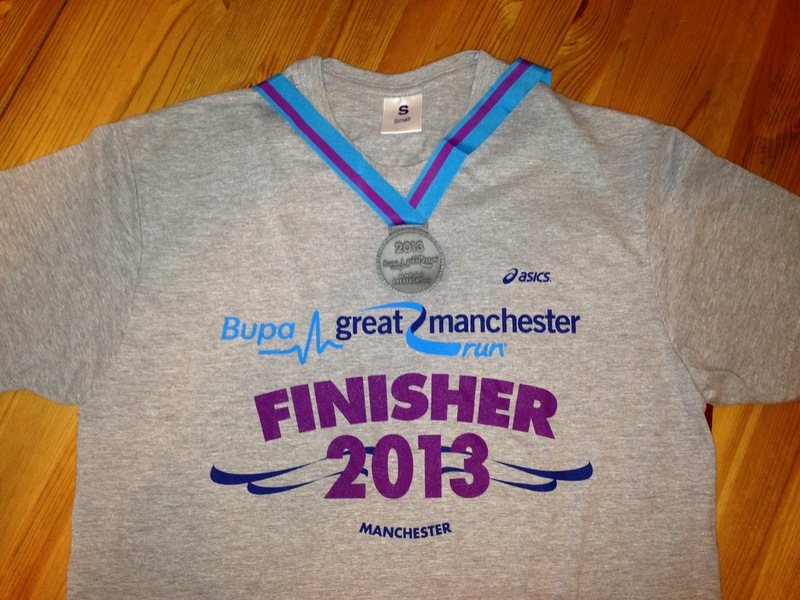 On Sunday 26th May 2013 I participated in the Bupa Great Manchester 10K run. 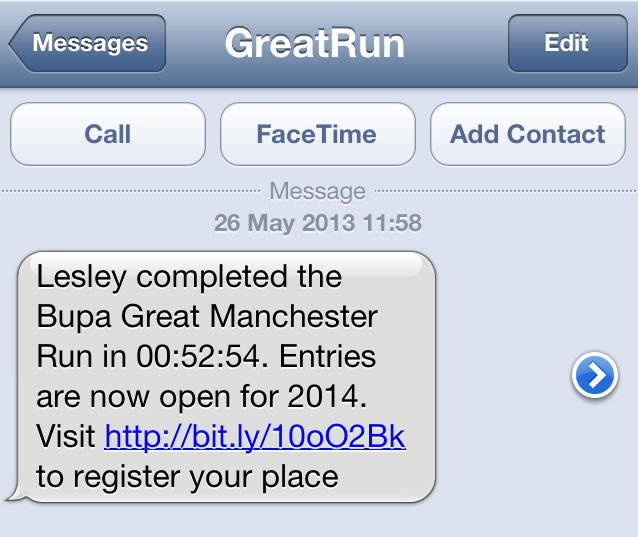 The Bupa Great Manchester Run is an annual 10 kilometre run through the streets in Manchester city centre, which was established in 2003. It is one of the largest and most prestigious mass participation runs in the UK, with approximately 40,000 runners and is part of the Great Run series of road races sponsored by Bupa. 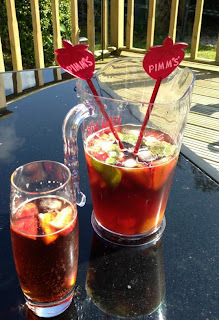 After doing the Great North Run twice I decided it was time to give another of these events a go! The day before the run I spent the day in the garden as it was a very warm and sunny day. Being a typical Brit I hadn't realised just how strong the sun was and ended up with sun burnt arms - not a good start! On the day of the race I woke up at 7.30am and yet again the sun was shining and it looked like it was going to be another hot day! I opted to wear my running shorts and vest (although my arms were still red!) and fuelled up with a breakfast of Porridge and coffee. We left Kendal at around 8.30am for the 75 mile journey to Manchester. The roads were relatively quiet which was surprising considering it was a bank holiday weekend as well as the start of half term! We arrived in Manchester at around 9.45am and got parked easily on a side street near the Arndale Centre. As I got out the car I realised it was much cooler in Manchester than it was at home and had to put my hoodie on to keep warm. I was beginning to think it was going to be perfect running conditions! 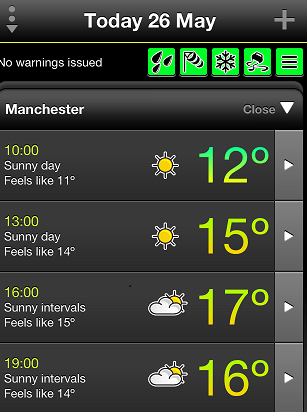 Feeling chilly on arrival in Manchester. On the way past, I took the opportunity to use the toilets in the Arndale Centre rather than risk the portaloo's at the start! As we emerged back on to the street we were surrounded by other runners. This was quite fortuitous as we didn't know the way to the start so we followed the crowd and prayed that they were actually going to the start and not to the pub! Although that would have been a good alternative! By 10.20am I had found the "white wave" starting pen, discarded my hoodie to my hubby and had claimed my place just behind the 50 minute pacer, who was waving a big placard in the air! By now the sun had decided to show it's face and it was beginning to warm up - rather too much! My initial thoughts of it being perfect running conditions were beginning to disappear! Mr Motivator style warm up! At 10.25am the "warm up" exercises started. Two fitness guru's who were high up in a "cherry picker" led the warm up in the style of Mr Motivator. Unfortunately we were so compacted in that to actually perform the exercises without taking out the competition was fairly difficult! I'm sure this warm up didn't do much good but it made us laugh and broke the ice with the people around me! 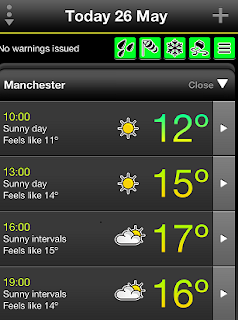 Even if we had managed to "warm up" we would have cooled down again before we started. The warm up finished at 10.40am and our wave didn't actually start until 10.55am! A fairly pointless exercise in my opinion. Once the wave in front of us had set off we were walked up to the start line, it was at this point that I lost sight of the 50 minute pacer! It was THAT crowded I couldn't see his placard in the mass of runners. I realised I was on my own and I would have to rely on my own pacing skills with my Garmin's assistance! I was amazed that even in this wave I was still surrounded by runners in fancy dress. One runner who was taking up more than his fair share of space was dressed up as a Rubik Cube! I didn't see him once we got running but I bet he caused some congestion issues! Where's Lesley? I am in there somewhere! At exactly 10.55am the klaxon sounded and we were off!! I literally shuffled over the start timing mat whilst giving a big cheery wave to the TV cameras. It was impossible to get into any sort of stride. I felt like I was in the middle of a rugby scrum rather than a running race as people hussled and pushed there way through. The most annoying types were the big burly men who thought it was acceptable to elbow you out the way and dive into the space directly infront of you and then slow down to a near walk. They obviously thought they were hero's who could run faster than everyone else but couldn't maintain it for longer than 30 seconds! There was numerous occasions in the early stages when I was actually tripped up by people doing stupid antics! I am amazed I finished the run without a fall or hitting someone! I was very tempted to stick my foot out and trip them up but resisted the urge in the name of good sportsmanship! The course was an out an back route although the start and finish were in different locations. At around the 2km mark the congestion started to ease slightly and we had runners from earlier waves passing on the other side of the road as they headed back to the finish. By now I was feeling fairly comfortable and could run at the pace I wanted. At around the 4km mark we passed Old Trafford where there was a wonderful atmosphere with a band playing and lots of football chants coming from the mouths of my fellow runners! Although there was a water station at the approximately half way point I was pleased I had taken my own water bottle with me as it was such a hot day. I would have struggled to stay hydarated without it! Even the high 5 sports drink in my sports bottle was hot but at least it was still wet if not very satisfying! At around the 6 km mark there was a shower to run though but due to the vast crowds I couldn't get to the right hand side of the road to benefit from this so just kept running - and stayed HOT! 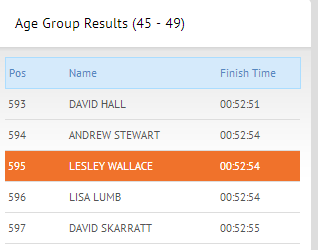 The website says it's a very flat course but there are a few small inclines that you can slightly notice whist running, especially up to the finish on Deansgate road but to be honest they aren't particularly significant, but in the heat felt mountainous! I could see The Hilton Hotel (Britain's Highest Skyscraper) in the distance for quite some time and I knew this was near the finish line. However, it appeared to be a mirage and it was quite some time before it seemed reachable! I have stayed at this hotel on a few occasions so it was a familiar sight to me. I tried to put on some speed as I headed towards the finish line to the cheering crowds but by now my legs weren't being very responsive and felt like lead! At this point I was passed by Superman, I felt like I needed some of his powers (or some wings!) to get me to the finish! Finished with the Hilton Hotel in the background! I was delighted to eventually cross the line without collapsing or vomiting, and was handed a bottle of water. My immiediate thought was "forget the water, where's the bling!" There was lots of television camera's wanting runners to stop and talk, but I kept on going! There was no way I was going to willingly appear on TV red in the face, extremely hot and sweaty! There was quite a walk to the chip collection point, then we were shepherded on to where the finishers packs were being distributed. After receiving my medal, t shirt and lots of other goodies in a bag I received a text confirming my finish time of 52:54. 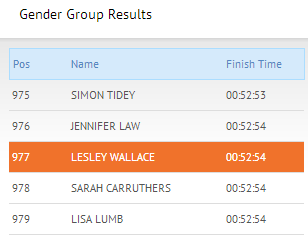 I was chuffed as it was a 10K PB for me but not as fast as I had wanted! Too many people and too much sun slowed me down!!! (makes for a good excuse!). Before the run I had planned to maintain a 8 minute mile pace which would have got me the sub 50 I so hanker after. Analysing my splits I started off well but unfortunately couldn't maintain it - 8.00, 8.00, 8.17, 8.22, 8.38, 8.39 - my run can be viewed here. 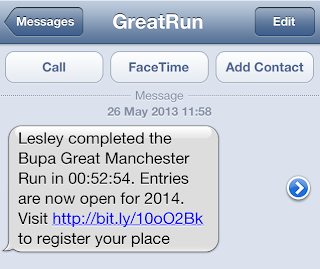 With an average pace of 8.21 minute miles perhaps on a cooler day I might have managed it! Once I had soaked up the atmostphere and watched some others finishing we made our way back to the car and straight for a very healthy lunch at ... McDonalds! I devoured a McChicken Sandwich and fries, followed by a McFlurry! I think I deserved it!! Once home, after a shower I took to recuperating in the sun (this time with suntan lotion on!) 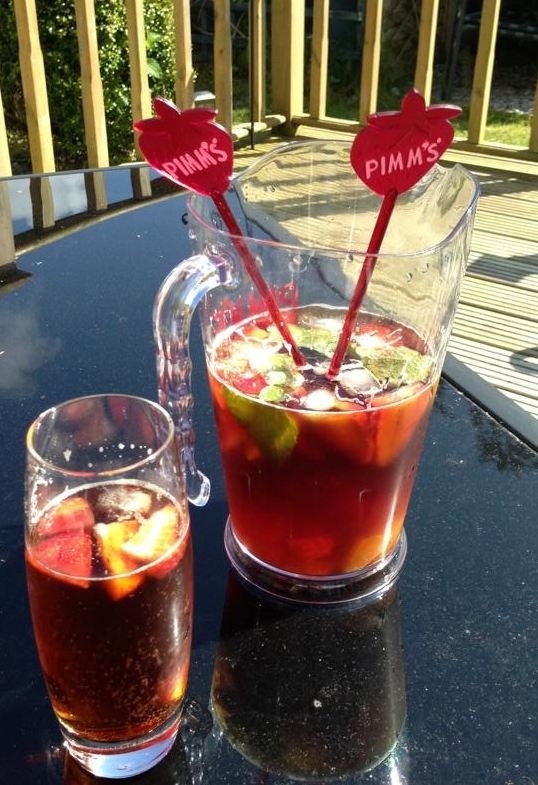 with a jug of pimms! So my review of the race? The heat and masses running had made it far more challenging than I had anticipated. The crowds of spectators are great for motivation and encouragement and this gives a great sense of occasion. However, the masses of runners makes it very congested with many people putting times in way faster than they can run cluttering up the waves early on making it a hazardous start. The contents of my goody bag! All in all a very expensive to enter 10K race but with a great goodie bag and medal! 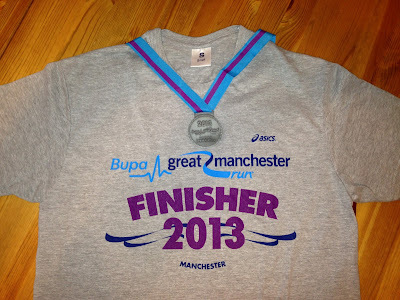 Unfortunately the finishers T shirt was just a cotton one and not a technical running one, so not particularly useful! 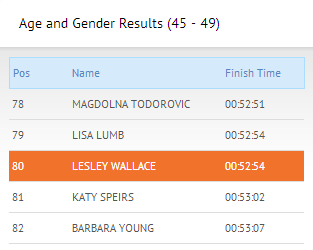 I was fairly chuffed with my overall results shown below, especially being 80th in my age and gender catergory!